I wanted to post this one to coincide with the Chicago Cubs thrilling World Series win, but I got bogged down with other stuff. Better late than never. Nine times out of ten when I make a card of a movie character I try to use a card design from the year of the movie's release. Rookie of the Year came out in 1993. I really feel no nostalgic kinship to any baseball card set after 1990, so it just wouldn't excite me to reproduce a 1993 baseball card design for this card. So, I went with a design I've been wanting to use for awhile, the 1988 Donruss baseball set. Now, as a kid I was not particularly fond of these cards. Don't get me wrong, if I was at a corner store that didn't have Topps, I would settle for Donruss. I guess I just didn't "get" the design. I mean I still don't, actually. Are those like some sort of Mario Bros. pipes? I seriously don't know. Plus, there was no managers in the set. No Sparky Anderson. For some reason 8 year old me saw the guy in charge of the Tigers' players as somewhat of a larger-than-life figure. Third, I was a mark for Topps' All-Star Rookie trophy (it always made me look at Matt Nokes like a super hero champion of baseball), so Donruss' Rated Rookie logo suffered by comparison to me. Strike four, I couldn't have cared less about putting together the Warren Spahn puzzle from the perforated puzzle cards. But I will freely admit that the Diamond King subset was pretty dope. I now have a great appreciation for this set and it's weird red and blue tubes. If for no other reason than nostalgia. In 1988 I would have traded oxygen and food for baseball cards. Design wise it was not too particularly challenging, but I love the way this came out. Of course I had to add the "Rated Rookie" graphic for this card as it would be near criminal not to for a movie called Rookie of the Year. As for the movie, it's a fun enough watch. 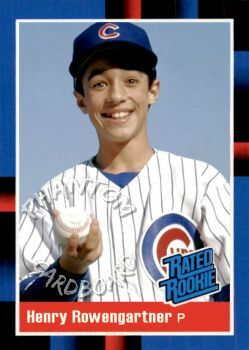 Interestingly the star of the movie, Thomas Ian Nicholas, and I are the same age. So, between this and his role in the American Pie franchise, his movies followed the coming of age timeline of my own life. Fingers crossed on getting this one back and signed from him.